master gunmakers in the world today. Not only does he make the Luger to the same standards of fit and finish as the originals, he also restores fine firearms to new condition. ere are very few men who can do this job properly and he is one of the best. His is the inspirational story of a hardworking young man who made good, showing what keeping your nose to the grindstone can do for you. EUGENE WAS BORN in Siberia in 1975, but not even the draconian anti-gun laws of the communist Soviet Union could stifle his interest in firearms. At 12, he read his first gun book, an encyclopedia with every new handgun by name and caliber. At 14, he built his first handgun, a matchlock, out of copper pipes and plywood. He used the heads of matches for powder and melted down lead fishing weights for bullets. Desiring to entertain his 10- and 12-year-old guests one day, he bolted the gun to a chair and fired it inside the house with a long fuse that gave everyone time to leave the room. The bullet penetrated the two layers of plywood put in front of the gun, the window curtains, two balcony plywood doors, and came to rest in the wall of a metal balcony. Realizing that creativity must be encouraged and a boy must be allowed to be a boy if he is to grow up into a real man, his parents did not punish him. The M1907 U.S. Army Test Trials .45 ACP Luger. Every summer from 12 to 16 years old, Eugene fired 200 to 300 rounds a day from an air-powered BB gun pistol at moving targets at a local arcade. Throughout his childhood, he also spent 10 hours a week at night school studying art with emphasis on oil painting and sculpture. We sculpture work proved effective for training his hands for steady, precise work. He learned to use milling machines in high school, where he also had military training, rifle shooting, and assembly and disassembly instructions for the AK-47 and PM, or Makarov, pistol. He finished high school at 16, having taken extracurricular classes in math, physics and chemistry in preparation for college. At 16, Eugene started college in the military division “Tracked Heavy Machines,” code word for tanks. College was very intense, with classes six days a week from 8 a.m. to 4 p.m. every day for 10 months. Eugene finished with a degree at 18. Later that year he moved to the U.S., and at 19 began a 23-year career as a computer programmer. 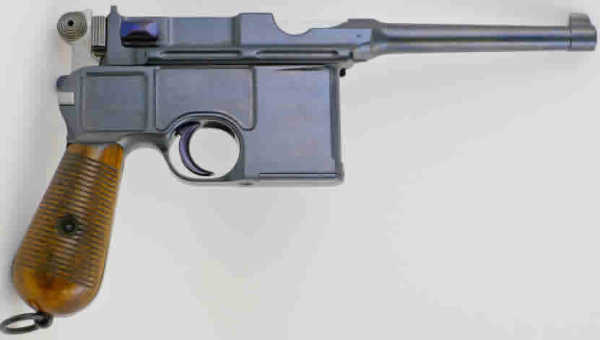 The Baby Luger version of the M1907 Luger. AT AGE 21, Eugene began collecting handguns and within three years had accumulated over 300. These were from World Wars I and II, as well as modern handguns of different designs and models. Eugene was buying them cheap and having local gunsmith John Robinson help him fix and refinish them. Being a practical man and serious student of handguns, every gun was purchased to feel it out, fire it, note the accuracy and recoil, disassemble, and study how good or how bad the design was. The guns were carried and every aspect of them duly noted. At 23, he restored his first revolver, a German Reichs revolver, for his father. His gun can be seen on his website: lugerman.com/restorations/reichs-revolver. it, and restored it to original condition. Two years into gun collecting, he purchased an American Eagle 1900 model. Eugene carried and shot a Luger extensively and found that he could hit a target better and faster with it than with any other handgun. Like most everyone who has really become familiar with Lugers, he loved the product line very much. In his fifth year of gun collecting, he decided to focus on Luger models, specifically on 1906 Contract variations. two of the M1902 Luger Carbines. As he was collecting, trading and selling Lugers, he began restoring them for himself. But as word got around the collecting circuit, others began calling upon him to restore their Lugers. Pretty soon he was restoring Lugers as a part-time gig alongside his full-time computer programmer job. machine so they could begin making the parts they needed. Over the next 15 years they made most of the parts for the 9mm Luger except the frame. M1911 pistol, the Army had a set of dimensioned drawings made of the .45-caliber Luger. merely followed the drawings. Eugene managed to convince Mike to sell the blueprints to him, as Mike was planning to stop production and was down to his last two guns. Eugene and his father went in together 50/50 to make the .45-caliber Lugers. They already had 20 years’ experience restoring guns. The restoration work continued but they stopped working as computer programmers, as there was no longer time for that. Their restoration and repair clients now number about 3,000 and they annually restore about 100 firearms and repair another 150. It took over two years to produce the first .45-caliber Luger prototype and about six months of blood, sweat and tears to make the prototype into a functional and reliable weapon. The company, Lugerman, now turns out 50 of the .45-caliber Lugers a year. Each gun is tested with 10 different manufacturers’ ammo and about 200 rounds fired through it to ensure perfect functioning before it is delivered. These are usable guns, despite their price, and because the Luger is so fast and easy to hit with, it can be the best life insurance in a gunfight. 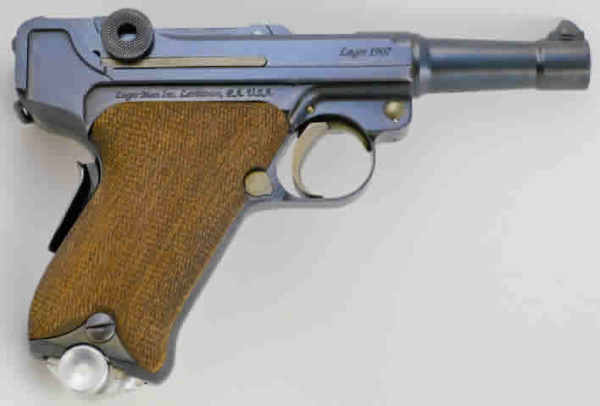 Lugerman also makes a .45-caliber version of Georg Luger’s personal carry gun, the Baby Luger. Because of the Luger’s superb accuracy, there is a 7-inch barrel target version as well. Having seen the M1907 shoot a 1-inch group at 50 yards, this seems an obvious choice for match shooting. The small scale of production results in a higher price than a gun mass-produced on the scale of a Colt or S&W. The M1907 costs $6,975 in carbon steel and $7,775 in stainless steel, the Baby Luger costs $8,275, and the 7-inch barrel target Luger costs $7,775. There is also a 16-inch barrel M1907 Luger carbine for $12,975. You are not only getting the original Luger’s standards of fit and finish, but you are also getting hand-tuning of each gun just like you would at a “best quality” gunmaker in Scotland or England. There is a 5-percent discount for active duty or retired military or police. 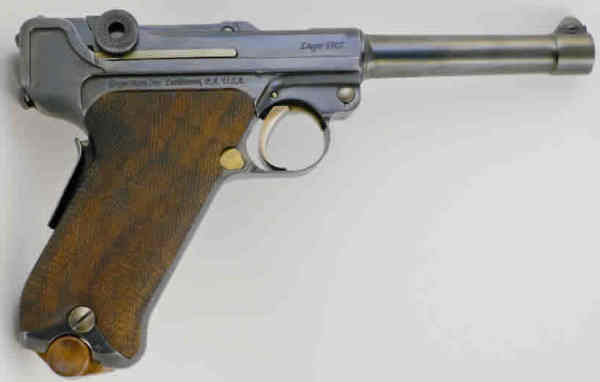 It is good to see Eugene keeping the Luger in production, even if it is only on a limited basis at the resultant higher price, as this is not only a piece of history but also one of the most effective fighting handguns ever made. When it’s your life and the lives of your family at stake, the price really doesn’t seem important anymore. Editor’s note: You can contact Eugene Golubtsov at eugene@lugerman.com or visit lugerman.com.